Background: Polymeric micelles are being used as successful nanocarriers for the delivery of diverse drug molecules due to properties like solubilization, selective targeting, P-glycoprotein inhibition, altered drug internalization route and subcellular localization etc. Objective: The present investigation was planned to prepare and characterize novel polymeric micelles derived from self assembly of amphiphilic chitosan-bile salt derivative (CS-mPEG-DA) as nanocarrier and evaluate their potential in delivery of an anticancer drug, paclitaxel. Method: Paclitaxel, a diterpenoid compound, useful in clinical treatment of several solid tumors such as ovarian cancer, breast cancer and lung cancer suffers from limitations like low aqueous solubility and bioavailability and subsequently was used as the model drug. Results: Paclitaxel was successfully incorporated into polymeric micelles using dialysis and emulsion method with encapsulation efficiency up to 95% having particle size in nanometer range (<200 nm). Paclitaxel loaded micelles were found to release the drug in a sustained manner up to 96 h in PBS containing 0.1% (w/v) tween 80 at 37°C. The micelles powders subjected to stability studies for a period of 90 days were found to be stable at 4 ± 2°C with respect to particle size and drug content. 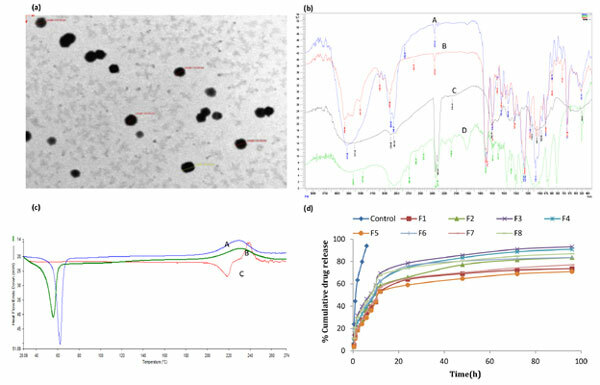 In vivo cytotoxicity assay confirmed that paclitaxel encapsulated in polymeric micelles showed higher cytotoxicity against cultured MCF-7 breast cancer cells than paclitaxel alone. Conclusion: Polymeric micellar systems derived from copolymerization of chitosan exhibit a great potential in successful delivery of poorly water soluble or low bioavailable drugs like paclitaxel. Polymeric micelles, amphiphilic, self assembly, chitosan, paclitaxel, copolymer.